VANCOUVER — Jacob Markstrom's quiet evolution into an elite NHL goaltender for the Vancouver Canucks hasn't surprised his teammate Alex Biega. The defenceman had already witnessed the six-foot-six netminder's ability to stun opponents four years ago when the pair were playing together for the Utica Comets in the American Hockey League. "You could just tell — when teams came into the building, they could tell that he had the capability of robbing the game. Even if we didn't play well whatsoever, he kept us in it," Biega said. "We won a lot of games because of him, solely because of him and the way he played. And now you're starting to see that at the NHL level." It's been a lacklustre season for the Canucks but Markstrom has strung together a series of career highlights. As of Saturday, he had more starts than ever (59), more saves (1,700) and more wins (28). In January, the 29-year-old moved into sixth place on the list of most victories by a goaltender in franchise history, just weeks after posting a career-high longest win streak of five games. Vancouver (34-35-10) was eliminated from the playoff race on Friday but Markstrom still sits among the league's top goalies, tallying more wins this season than Matt Murray of the Pittsburgh Penguins and Nashville Predators goaltender Pekka Rinne. "He's having a really good year. He's become a really good goalie in the league now. He's been a big part of a lot of our wins," Canucks coach Travis Green said Saturday after Markstrom helped the team to a 3-2 shootout victory over the Dallas Stars. The journey to becoming a star goalie has been long and bumpy for the native of Gavle, Sweden. Picked by the Panthers in the second round of the 2008 draft, Markstrom spent four years in Florida before he was dealt to the Canucks for beloved goalie Roberto Luongo in March 2014. He continued to toil in the minors for years and helped the Comets reach the Calder Cup final in 2015, when Green was still coaching the team. Now in his second season as a true NHL starting goalie, Markstrom has matured, the coach said. "He's a competitive guy," Green said. "I think he's learned to control his fire a little bit and not take losses as hard. And that's really helped him mature in his game as well on the ice." Last summer, the Canucks brought in goalie coach Ian Clark to work with Markstrom and the club's other netminders. Clark had spent the past seven seasons with the Columbus Blue Jackets, where he helped mould Sergei Bobrovsky into a two-time Vezina Trophy winner. Soon after getting the job, Clark travelled to Sweden to meet with Markstrom for the first time and talk about his philosophies — including that being an elite goaltender is a lifestyle choice. "This is not about just coming to the rink and trying to play goal," Clark said. "What are you doing recovery wise? What are you doing maintenance wise? What are you doing nutritionally? What are you doing rest wise? What are you doing to honour this great responsibility you have to the franchise?" One aspect of Markstrom's game that needed work was his ability to keep pace with what's happening on the ice, the goalie coach said. This year, the pair worked continuously on everything from visually tracking the puck to decision making, all in order to give Markstrom more organization in his game. The result is a netminder who consistently appears focused and calm, able to make highlight reel-worthy saves on some of the league's most skilled shooters. "He's one guy we can rely on every night to show up. You've seen it all year," said Thatcher Demko, the Canucks backup goalie. The 23-year-old was called up from the AHL in early January after the Canucks dealt backup Anders Nilsson to the Ottawa Senators, and he's been soaking up Markstrom's knowledge and experience ever since. "He's definitely been a huge resource for me so far and it's been a great relationship," Demko said. "He's been through it all — going through ups and downs, getting traded, going down to Utica. This year I really think he's found his stride. He's really improving and he's staying positive through the whole situation. He's definitely a guy I can look to." For longtime teammate Biega, watching Markstrom grow as both a player and a professional has been nice. "I'm sure there's a lot of guys in this locker room that look up to him," Biega said. "He's a leader, he's a vocal guy. He doesn't take himself too seriously. A very kind, humble person. And he wants to win." It's important for goalies to have special connections with their teammates, Clark said. "You always want your goalie to be loved by their teammates. 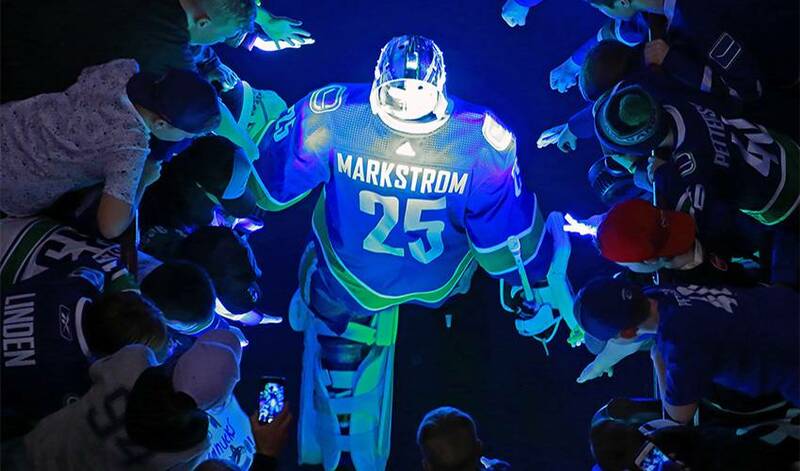 Because they're going to go to war for you, they're going to put up a wall in front of you," he said, adding that Markstrom cares a lot about everyone else in the locker room. "The best way he can take care of his teammates, besides being a good guy, is to take care of his game to support them." Markstrom agrees that carrying himself like a professional both on and off the ice is key to helping his team. "I had two of the best teachers in Henrik and Daniel (Sedin) when it comes to that. I learned a lot from them," he said. "The most important thing for me is to lead by example. And that's coming into work every day, playing good hockey. If I play good hockey, all the guys are going to want to follow and play good too." Despite his success this season, Markstrom isn't ready to reflect. After all, the Canucks still have three games left. "We've got to play 82 games for me to look back and see how the season's been," he said on Saturday. "We've still got hockey to play and I'm still focusing on the process and getting better every day."